Hewlett Packard is promoting new PCs with Windows 7 instead of Windows 8 as a "familiar and intuitive environment." The unfamiliar interface of Windows 8, Microsoft's attempt to bring PCs, mobiles and tablets together under a single big tent, left a lot of people scratching their heads. I'm not aware of it being plagued by any major technical flaws but imposing an interface designed first and foremost for touchscreens onto a mouse-and-keyboard environment, and abruptly cutting out the "Start" button we've grown so used to over the past decade and change, left an awful lot of users cold. Recognizing this fact and presumably sensing an opportunity, Hewlett Packard has taken the unusual step of recommending Windows 7 as a preferred option on new PCs. 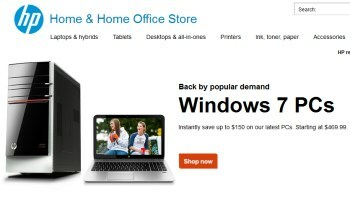 Head over to HP's "Home and Home Office Store" and you'll be greeted by a message stating, "Back by popular demand: Windows 7 PCs," along with links to desktops and laptops all sporting Microsoft's previous-gen operating system. Windows 8.1 rigs are still available, of course; just scroll down a bit, past all the big savings, and there they are. I can't recall anytime in the past when a major PC manufacturer rolled back to an earlier version of Windows - and, even more importantly, made such a big deal out of it. And while Microsoft may not be entirely pleased by the tactic, there's no arguing the numbers: As we noted earlier this month, less than 21 percent of Steam gamers have adopted Windows 8 or 8.1 since its release in late 2012, while nearly 66 percent are still using Windows 7. I remain a committed Windows 7 user myself, with no interest in upgrading until Windows 9 makes the scene. How about you?